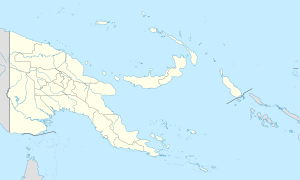 Lae, the capital of Morobe Province, is the second-largest city in Papua New Guinea. It is located at the start of the Highlands Highway which is the main land transport corridor from the Highlands region to the coast. Lae is the largest cargo port of the country and the home of the University of Technology or ‘Unitech’. The town was born in the gold rush era of the 1920s and 30s. Like numerous Papua New Guinea towns it sprang up around an airstrip which is now disused as it has been replaced by the new Lae Nadzab Airport, built by Australia as an independence present. Unfortunately, this airport is 40 potholed kilometres from the city. Cargo arrived in Lae and then was transported by air to the goldfields in Wau. In July 1937 Lae made world news when American aviator, Amelia Earhart, was last seen flying out of the airport on her way back to the USA. She was never seen again. When the volcanic eruptions occurred in Rabaul in 1937 a decision was made to transfer the capital of the Territory of New Guinea to Lae. World War II got in the way of the transfer and in 1942 the town was occupied by the Empire of Japan on 8 March 1942. Lae, Rabaul and Salamaua became the major Japanese bases in New Guinea. In mid-1943, after defeats in the Kokoda Track campaign, the Battle of Buna–Gona and at the Battle of Wau, the Japanese were forced to retreat to Lae and Salamaua. However, the Salamaua–Lae campaign involved many weeks of fierce fighting, before the town fell to the Allies on September 16. Lae’s development after the war is directly linked to the development of the highlands. Coffee and tea were being grown and a port was needed. Later priority was given on road access, and the Highlands Highway came into existence. During the mineral boom of the 1980s and 90s Lae’s importance as an economic hub became clearer. In 1991 Lae and Port Moresby hosted the South Pacific Games. Lae is currently known for its high rainfall and the great number of potholes in its roads, earning it the nickname “Pothole City”. On 18 April 2010, a 6.9 magnitude earthquake struck 30 km or 20 mi east of Lae, with no immediate reports of damage. With more than 1.2 million members in 33,000 clubs worldwide. Rotary club members are volunteers who work locally, regionally, and internationally to combat hunger, improve health and sanitation, provide education and job training, promote peace, and eradicate polio under the motto Service Above Self.